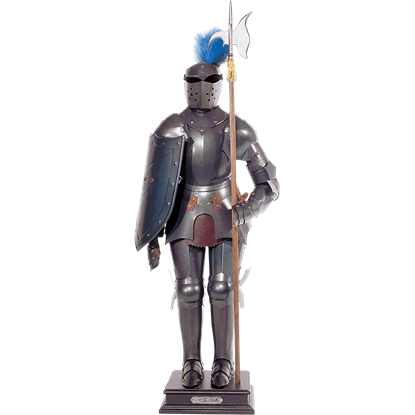 An exquisite display of medieval armour, the Dark Steel Miniature Suit of Armour is a superb decoration to demonstrate your fascination with the Middle Ages. For supreme realism in this design, the armour is crafted from steel. 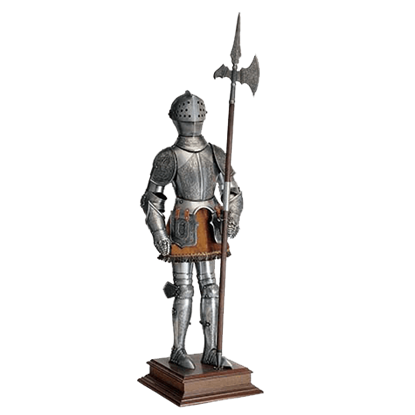 The Miniature 16th Century Spanish Armor with Halberd by Marto is a miniature replica based on suits of armor used during the time of Charles V and Philip II, today a part of the collection of the Real Armeria (Royal Armory) in Madrid. The Miniature 16th Century Spanish Armor with Sword by Marto is a miniature replica based on suits of armor used during the time of Charles V and Philip II, today a part of the collection of the Real Armeria (Royal Armory) in Madrid. 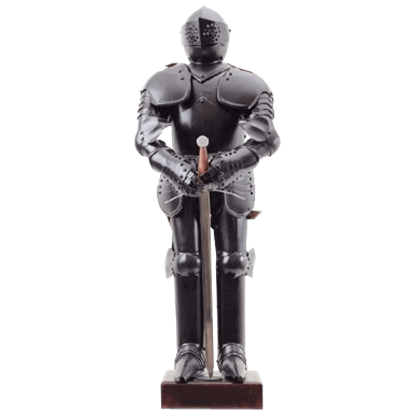 This Miniature Black Medieval Suit of Knights Armour looks just like the real thing, except it is a miniature replica that fits perfectly on a desk or table. 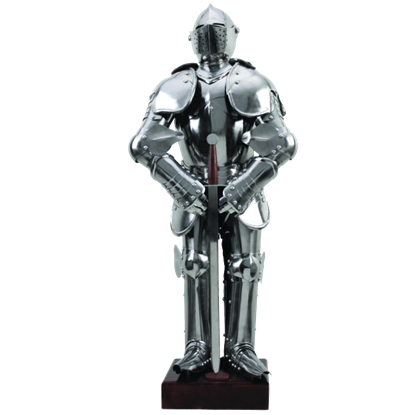 Made from solid stainless steel, this replica features amazing detail. The Miniature Gold 16th Century Spanish Armor with Sword by Marto is a miniature replica based on armor used during the time of Charles V and Philip II, today a part of the collection of the Real Armeria (Royal Armory) in Madrid. 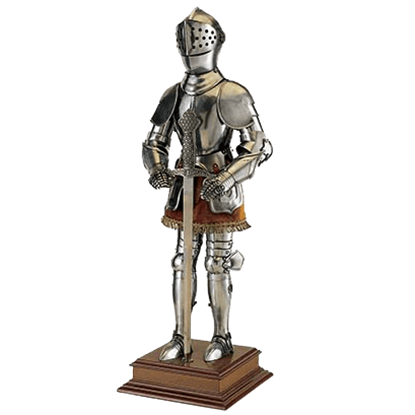 The Miniature Medieval Suit of Knights Armour is a fun and unique way to display your interest in the Middle Ages. 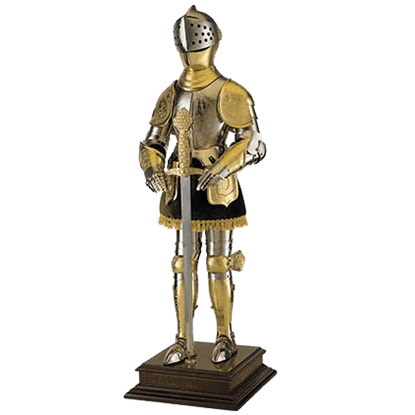 A detailed depiction of medieval armour, this realistic miniature ensemble is crafted from solid stainless steel. 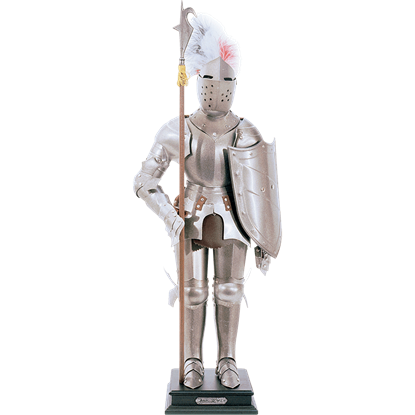 Beautifully replicating medieval Milanese armour styling, the Shiny Steel Miniature Suit of Armour is a fantastic decorative piece that includes a replica gisarmes and heater shield to complement the full suit of armour.